When you are standing, for instance in a queue, where does the weight of your body fall? Do you tend to stand on one leg, and if so which leg? Is it always the same one? Does the weight tend to fall through the front or the back of the foot, or is it distributed more to the outside or the inside of the foot. What sensations do you experience in your feet? What do you do with your head when standing? Does it tend to lean over to one side? Notice what you do with your arms and hands, your shoulders and chest, your pelvis. Notice any sensations you may be feeling in your body. 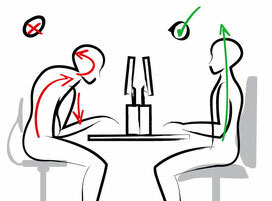 In a similar way, observe where the weight falls when you are sitting, and give attention to that sensation. Do you carry the weight more on one buttock? What do you do with your legs when sitting? Do your feet touch the floor? What do you do with your head? 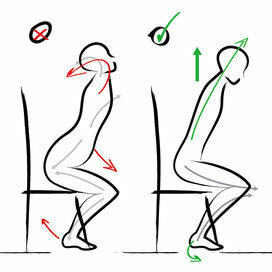 Also notice if your back is curved or straight, and whether your shoulders are hunched or dropped, or go backwards or forwards. Notice any sensations that you become aware of as you turn your attention onto your self. Build up a picture of your body in the sitting position. This time you are observing yourself while moving, which is more complex. Once again notice where the weight lands on your feet. Build up a moving picture of yourself walking. Do you have a sense that one part of your body is leading you when you walk, for example your pelvis, or your chest, or some other part? Notice other people walking and see if it looks as though they are being led by a certain part of the body. Look at the differences in the way different people walk (or stand, or sit). How does your walk alter when you are tired, or full of energy, happy or sad? And notice your thoughts and feelings. Does walking become associated with habitual thoughts or emotions? First of all try talking to yourself, and do it somewhere where no-one is going to be watching, such as in the bathroom. This is useful because you can use the mirror to help your observations. To begin with do not use the mirror. Start talking about something quite simple, such as what you are planning to do that day, and give attention to your whole self, not just the face and throat, in the way I have described in the ’Standing’ section. Then give attention to your head and neck, your mouth, chin and jaw, your eyes. Notice what you do with your hands and feet when you are talking, and with the rest of your body. Is there some particular part of you that seems to get very tense when you talk? Do you notice other sensations anywhere? Now observe yourself in the mirror, as you talk. See where the muscles are working in your face, throat and shoulders. Notice also the thoughts and feelings you are having as you do this exercise, especially your responses to looking in the mirror. There should be a great wealth of habitual responses for you to find in there! After examining yourself talking on your own, see how easy or difficult it is for you to observe yourself when you are talking to someone else. Remember you are looking for an idea or a picture of what your body is doing, the sensations it is feeling, as well as the habitual thoughts and emotions you may notice cropping up when you talk, such as ’I do enjoy communicating’, or ’I hate the sound of my voice/ accent /lisp’ etc. Notice your immediate reaction to this stimulus and what your habitual response is to the telephone and/ or the doorbell ringing. Notice not only what you do but also what you think and feel. What are the first sensations, thoughts and feelings you have when you wake up. What position are you in? Is it the same every morning?